These simple protectors are designed to cover the corners of your bumpers and look like part of your car’s trim. They are sometimes called protector strips, and work by shielding bumpers from the scrapes and scuffs that you might pick up in car parks. We offer hihg quality of Bumpers/Protectors Front. 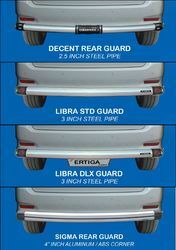 AJANTA Launch new NINJA STD guard for Innova 2012. NINJA STD guard is made from high quality of steel, abs plastic material & Available body colour paints or Black/ Silver combination with judgement rod (steel). This would make your Innova appear more attractive & rigid. Whole sellers will get additional discount. With the aid of years of understanding and experience of this domain, has helped us in presenting clients with the superior quality of Scooter Mudguard Bumper. We are one of the most well-distinguished companies in the market that are into offering Street Bumper Protector. Smart looking body color front and rear bumpers. Adds to its bold personality.